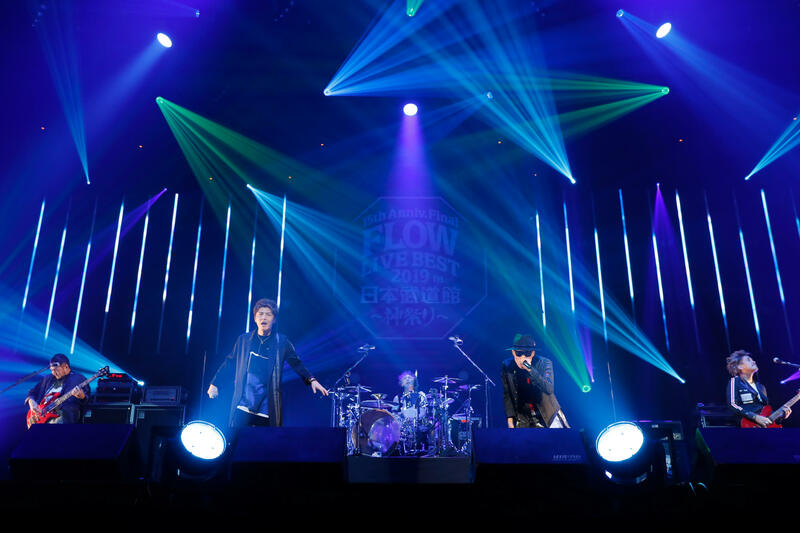 Japanese rock band FLOW performed at the legendary Nippon Budokan for the first time in 10 years on January 30, 2019. 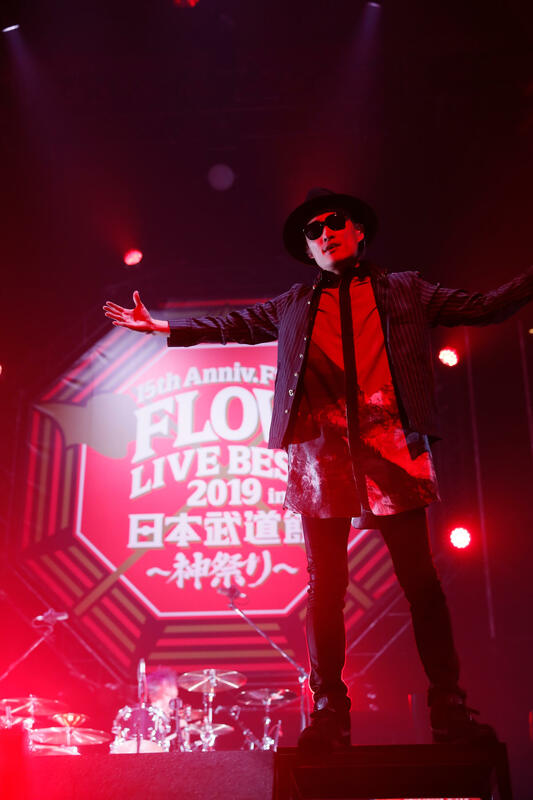 The concert was titled FLOW LIVE BEST 2019 in Nippon Budokan ~Kami Matsuri~. This is a live report of the show. The night began with the aggressive sounds of Break it down at which the curtains dropped. 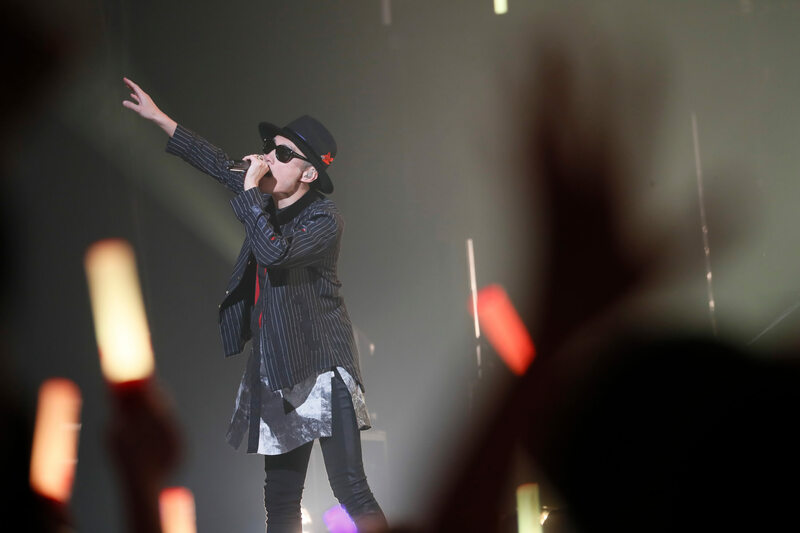 The venue floor was dotted with the red lights of fans’ glow sticks which vocalist Keigo and vocalist/guitarist Kohshi gazed at while letting their voices out. The band moved onto the lamenting headbanger rock tune JOY TO THE WORLD and 7th Heaven which they performed early on at their last Budokan show too. Drummer Iwasaki and bassist Got’s fired up the crowd even more with their intertwining beats. For Steppin’ Out the band took out and waved around a flag made from towels while chants echoed throughout the indoor arena during Oi!!!Oi!!!. The band followed up this comment up with the loud, heavy and emotion-releasing Akai Siren. After the passionate Red Hot Riot the venue was dyed in blue lights as Brave Blue ensued followed by COLORS, both monumental works for the band as anime songs. The title of this concert is Kami Matsuri, or “Festival of the Gods.” The words “Kami Area,” or god area, were written at various locations around the venue where the crowd stood. In front of the stage was the Fighting Dreamers God Area, the former part being a reference to the band’s famous song GO!! !, and there was also the East God Area, West God Area, and Heaven God Area. 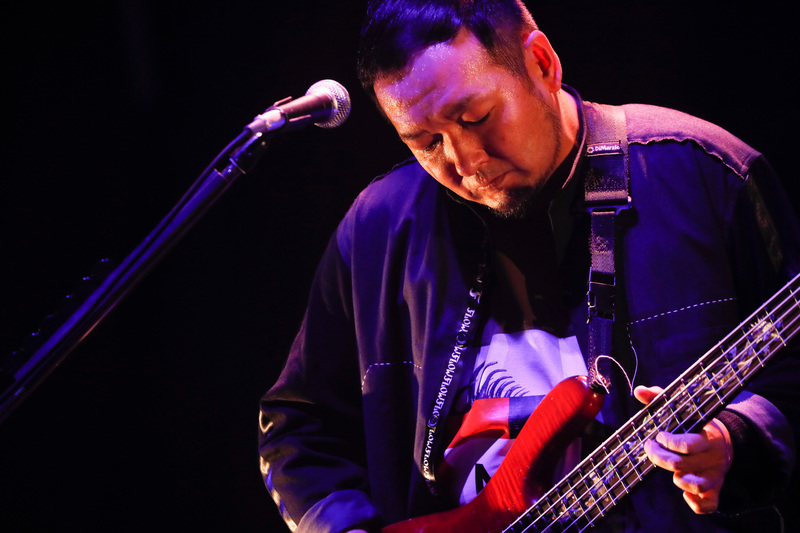 Keigo and Kohshi explained that the title of the show wasn’t connected to the band’s songs, but rather that each and every fan gathered there were themselves a god. “This is a festival of the gods precisely because we all summoned you here today,” said Keigo, which received a round of applause from the crowd. “We have a classic old FLOW with us today,” announced lead guitarist Take. He began to play something which the crowd responded to with delightful voices. It was Melos. This song was the last single of FLOW’s days as independent artists. They continued with Tokonatsu Endless. This is a song that did not exist yet 10 years ago at the last Budokan show, and the crowd came together to sing along. Next was Neiro in all its piano-ringing glory. Kohshi picked up a guitar for this one too and layered in more sounds to the music. Answer melodic-ly fused electro sounds with loud rock while Shakys was a performance of old school rock ‘n’ roll. Keigo opened his mouth and spoke of their memories 10 years ago. He explained their last Nippon Budokan concert was one the fans brought them to, and how they are able to return once again to the same venue this time around. 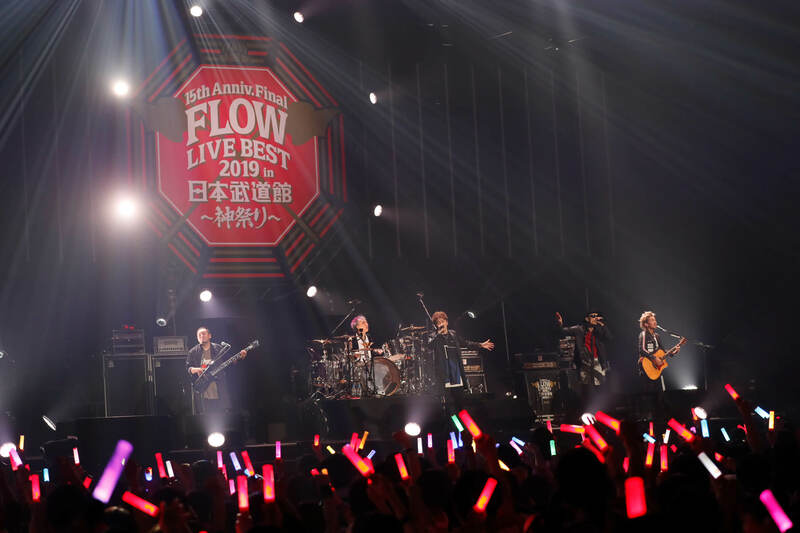 He said that 10 years ago, which then was 5 years since their debut, FLOW weren’t sure what kind of band they were and even thought they were able to connect with fans in their hothead shows, still struggled. 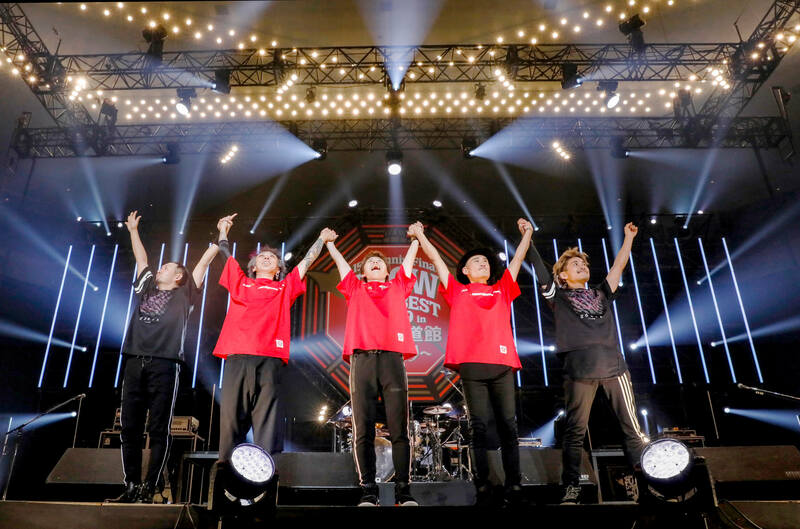 But Keigo explained that 15 years on since debuting during which they have both accumulated fans and performed live up and down the country there was something he could say for certain. Following this proclamation the five members played ONENESS, a ‘theme song’ the band wrote specially for this night. The moment FLOW and the fans came together for this song was when the song was truly complete. 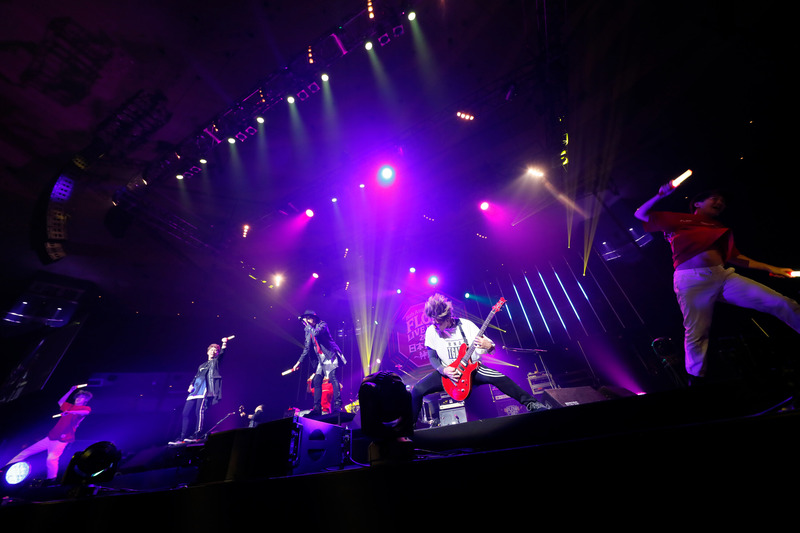 The band were then joined on stage by GRANRODEO, their good friends and rivals who they always said they wanted to be there when they stood on the Budokan stage again. The special seven-member superband performed Howling together, the opening theme for season two of the anime series Seven Deadly Sins. 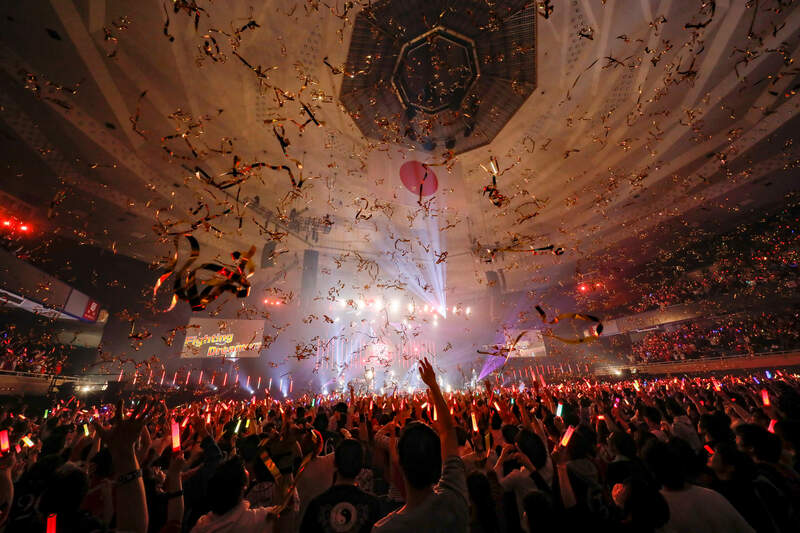 As the band entered the final act of the night, they began playing a light and casual intro during which GinyuforcE and Real Akiba Boyz dashed onto stage. 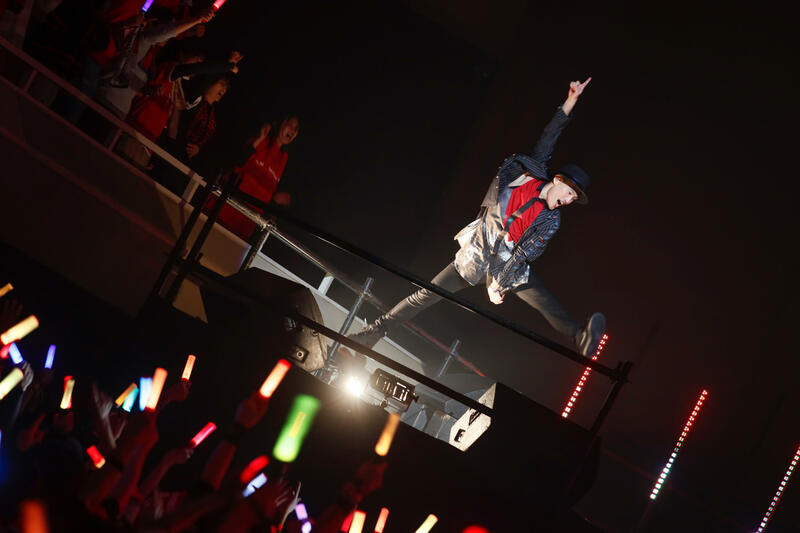 They all performed Ai Ai ni Utarete Bye Bye Bye, HERO ~Kibou no Uta~ and their famous Naruto hit Sign. The crowd’s voices piled on top of one another at Kohshi who emotions poured into his voice while basked in the blue lights of the arena. The crowd sang in chorus the loudest they had during the concert for Kaze no Uta. But it was GO!!! that sealed the deal with the band and crowd jumping together. “All of you gathered before us are the reason we’re a band! Budokan! This is the song of our companions! Sing it!” said Keigo as the band performed ANTHEM. This song felt deeply etched with the fact that the band has evolved, because of the fans gathered at the venue and because the band also has fans who weren’t able to make the show. The stage screen split into five parts, one for each of the five members. The fans sang and watched each of their expressions as the members reflected on their thoughts and feelings. Garden began to play. This was also the final song of their previous Nippon Budokan concert. The main part of the show came to a close here. For the encore FLOW performed their new song PENDULUM and 2003 debut track Blaster. FLOW will continue to evolve before fans and into the next generation. We look forward to seeing where they go next.